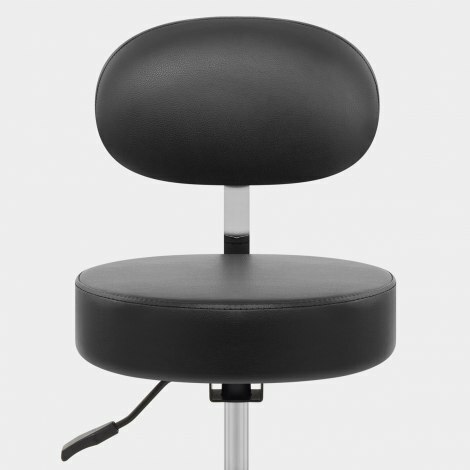 Perfect for use as a stool within the home or as a stylish office chair, the Swivel Stool With Back Black is a wonderfully versatile design with a myriad of different uses. The Swivel With Back has it all and is the multipurpose piece your interior needs. 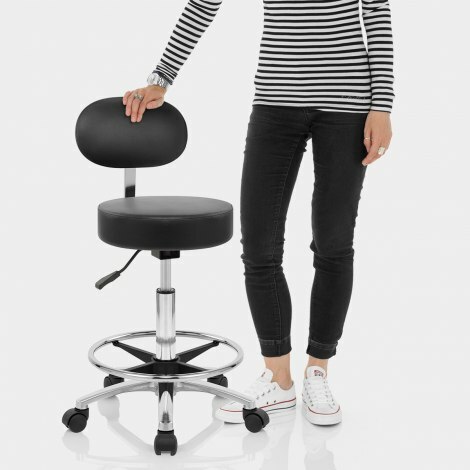 Padded for comfort and upholstered in trendy black faux leather, the round seat delivers a chic minimalist look whilst the elevated oval backrest works to maximise seated support. Concealed within the polished chrome stem, a gas lift mechanism allows for variable height and 360-degree swivel. Five spokes emerge from the central column to form the legs, with a circular adjustable height chrome footrest and contrasting black connectors. Durable black nylon also features on the wheeled castors below, enabling ease of movement whilst also helping to protect floor surfaces. "Attractive, sturdy and fit for purpose"
I can thoroughly recommend this company and their product. First class fast and efficient delivery, with absolutely no issues. Great stool at a great price. Easy to put together. Can’t wait to use it in my art studio. Buying this stool has been a great experience. It arrived perfectly packaged ahead of time and was very easy to assemble. The stool itself cannot be faulted and is exactly what I had hoped it would be - perfect for my needs! An excellent product. Bought it to use in my workshop at home. It provides both comfort and great back support. The quality of the materials are of a high standard and it looks stylish too! Product was exactly as described. Very pleased with it. Also commendable is notification of delivery,. Would recommend this company. Just what I wanted, great guitar stool with back rest and adjustable height. Easy to assemble and comfortable. Nothing more to say!